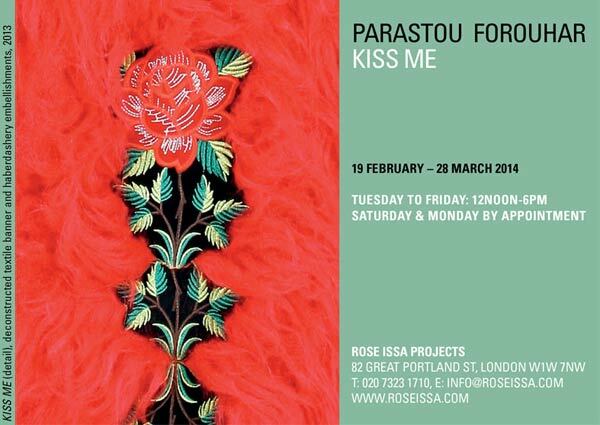 This is the third solo show in London for Parastou Forouhar, whose latest body of work, the Kiss Meseries of textile banners, is an exciting new chapter in her art. In Forouhar’s series, she has embroidered the medallion with lyrics from a famous 1950s pop song, Mara Beboos (“Kiss Me”), by the “Iranian Elvis”, Viguen Derderian, and embellished the banners with feathers, furs, sequins, and appliqued motifs. Kiss Me can be interpreted as the artist’s gesture of reconciliation towards the past and an attempt to quell current tensions, crises and chaos with an uplifting message of affection and harmony, it is also slyly subversive: Mara Beboos first became a hit in 1953, when Iran’s short period of democracy under Prime Minister Mohammad Mossadegh came to an end with a military coup. The song thus became a kind of poignant farewell to Mossadegh. By referencing this song, Forouhar is not only enveloping her past and future in a warm embrace, but referencing the glory days of a secular regime.